It was for a moment even scary to think of such powerful country, showing off their synchronism with drums, their physical efforts to prove a political view and how many medals they will win. It was almost a vulgar display of power in a polluted city. Jaw-dropping, yes. But even I forgot about the Tibet. Diana didn't. 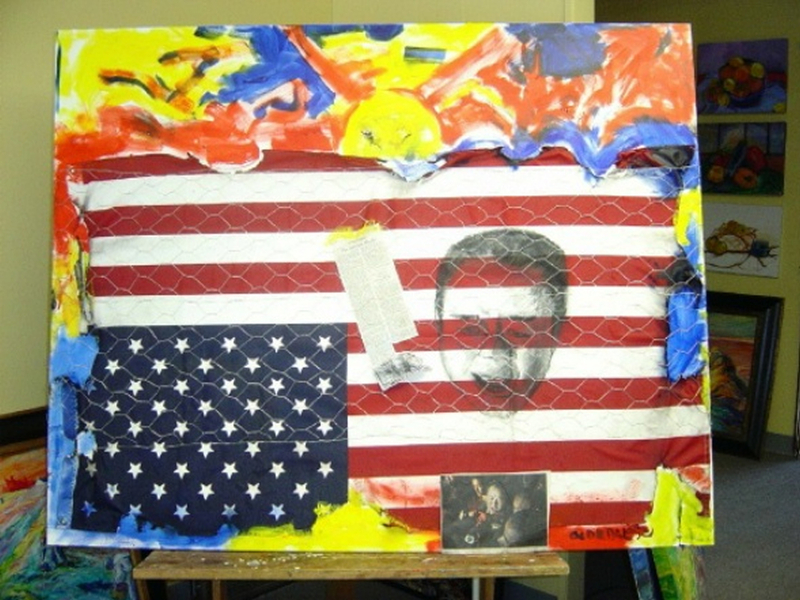 My mixed-media piece, Freedom On Fire, uses the American flag to show that our power to help the nation of Tibet has been greatly reduced by our owing the People’s Republic of China hundreds of billions of dollars. The monk cries out in vain. Our country is being singed around the edges, as the fire of our economic recklessness increasingly destroys our ability to promote freedom around the world.